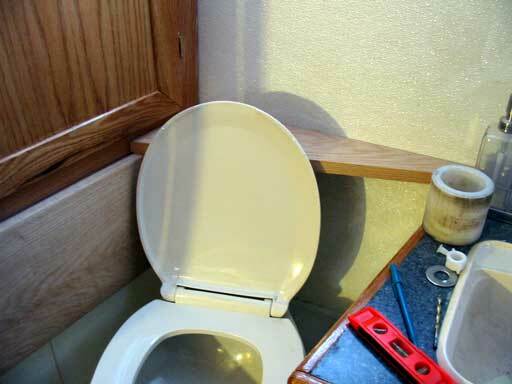 This isn't going to be toilet talk, but really it is! And 2 days running to boot! 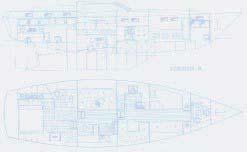 It is an important area of the boat, and must be treated as such. 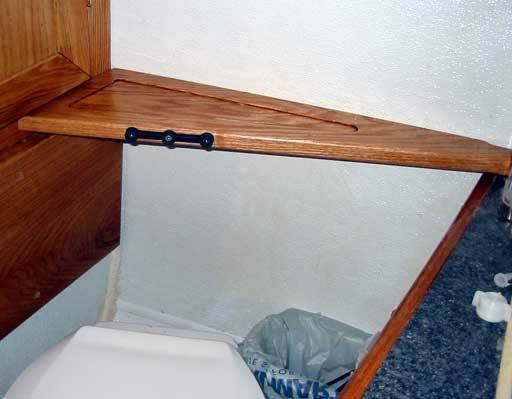 In fact, only actually being on a sailboat for a few days makes one realize how important a good working toilet is. Of course there is the "bucket" or "natures way" but hey, lets be yachties! After some time "trying out"...well, pretending to, as we can't turn on the water just yet, I suddenly noticed that there is no support for the seatback because there is no tank! Funny this isn't even mentioned in the manual. Heeled over to starboard a few degrees, and a number 2 on the way, that back would snap off like a twig on the first lean. 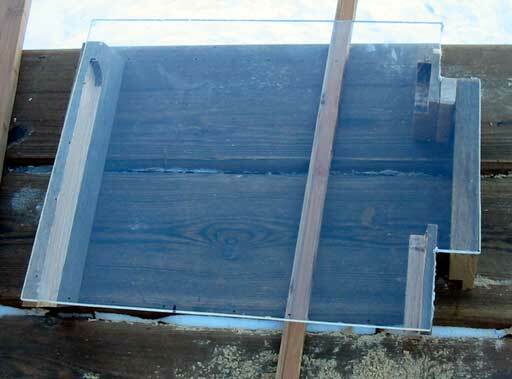 The solution is to put in a little, albeit useless really, shelf with a rubber bumper. This bumper was pulled out of someone's Kenworth truck. I knew it would come in handy for something! After a little routing with the Dremel routing setup, it looks kinda cool. Too bad it's too narrow to mount the garbage bin under it. Because of this, some continuity need to be added across the vanity. I tried different things and found a length of bamboo flooring capped with some 1/2" quarter-round made a cool looking back. It would also support the triangle shelf. There it is all in place. I sealed the counter-to-wall behind it ( as one should always) with silicone, and plan to run a bead along the edge once the next coat varathane is good and dry. This wasn't the only thing I did today (and it was a long long day!) as sometimes there's just boundless energy flowing with us both at the same time so we work long and late. 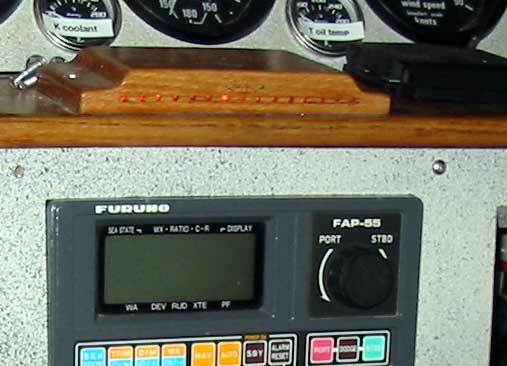 Gena ordered me ( he he) to " get that damn rudder indicator installed. I wish it was just a simple matter of plugging a couple of wires and screwing it down, but noooo. 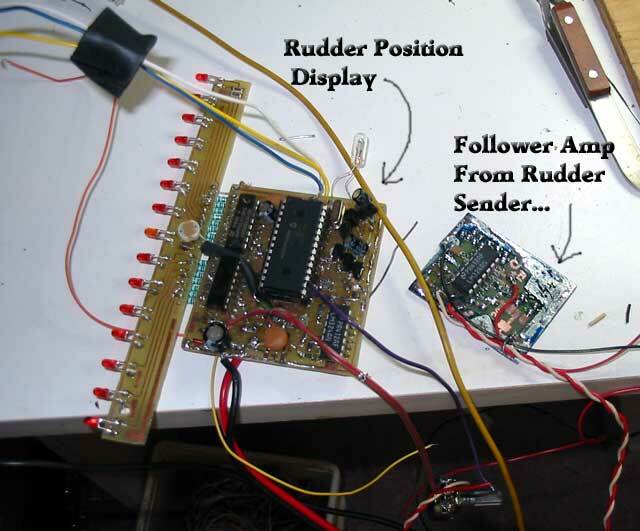 We had discussed my previous wiring scheme of powering the sensor, at the tiller arm, from both the auto pilot and the rudder sensor using diodes. This is so If one is off, the other still works. A couple of days ago, a problem popped up in that if the auto pilot is off, it puts a fair load on the sensor line, which in turn knocks off the readings to the other unit. To compound the problem, Gena wants an analogue meter at the pedestal which will put more uneven load on everything . Monster wiring job behind gauges! The dimmer works nicely, and those (ug!) bulbs in the sealed wind indicator gauges work (after some fiddeling) well too! The whole unit can be shut down via a switch on the main panel under the dimmer switch. Rudder / Dimmer unit mounted at last! 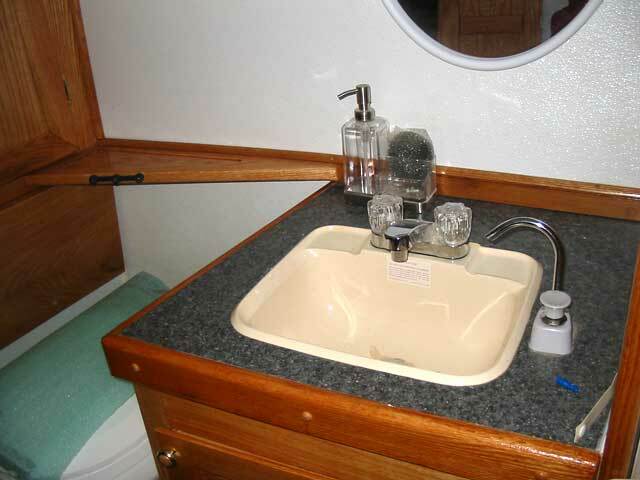 I was surprised when I saw she had used my "painted wood grain" vent grills. These were originally white but ugly yellowish white (like bad teeth!) so I got artistic one summer afternoon and pulled out the acrylic paints. She said they were the color of baby sh*** and she wasn't going to let them be in the boat. I guess they must've darkened with age or something because there they are! One or two of these have fans, notice the switch under the lower right inset, to force air through when needed. 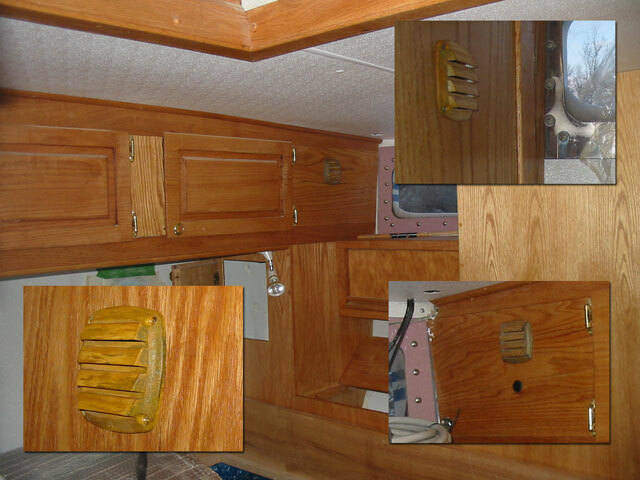 The whole aft cabinetry is basically piped and vented together. 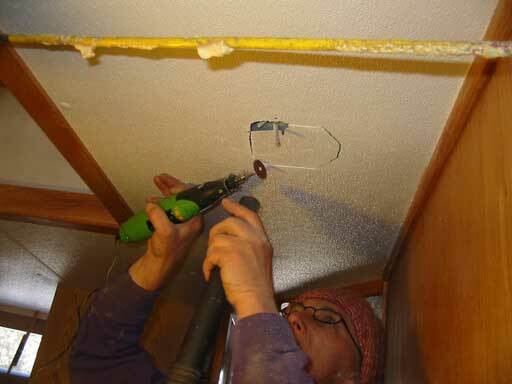 This will allow moisture a lot of escape routes. 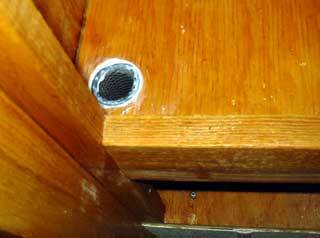 This photo shows a hole that leads air through a pipe to the smaller flip-up door cabinets. Wow! Finally, I began construction on the Dash PC case. This is so we can look at electronic charts and track our position in real time. Gena will probably use it to play cards or video games, but hey what ever gets you through your watch! 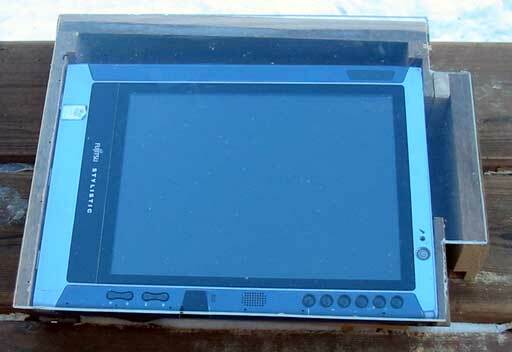 Inserted in the track is a fujitsu pen tablet PC. One of 4 we will have on board. They are expensive new, about $3500, but can be found on the used market for $500 - $1000. ( 1gig CPU +1gig ram ) and are tough, well built, and reliable. I have toted one around for 4 years and it's never missed a beat. Can't say the same for lap tops. The "pen" can work through the Lexan, but for ease of use I plan to add a USB trackball to the arm rest. In the box, under the PC, will be mounted a video input card, a USB hub, and an RS-232 dongle for NMEA input. More on this soon!